"Senior Living : Discover The Secrets To Living Your Golden Years To Their Fullest" is the definitive eBook for answering all of your questions about loving life as an active, healthy senior citizen. How many times have you heard the words, "senior citizen"? Have you ever wondered what it would be like when you could finally call yourself a part of this community? Do you have questions that no one seems to be able to answer? Are you worried that you might not be prepared for these years of your life? Maybe no one ever took the time to talk to you about what it was really going to be like as a senior citizen. Perhaps your parents died young or they just didn’t want you to worry about what it was like for them. Have you felt like maybe you don’t know the whole story and that it might be better if you did? 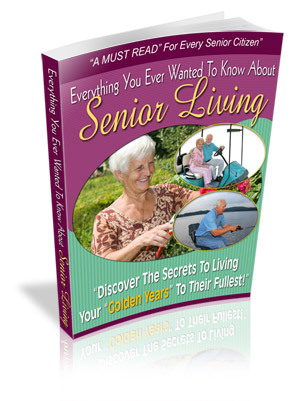 In "Senior Living : Discover The Secrets To Living Your Golden Years To Their Fullest" you’re going to learn all of the answers to your most burning questions. Not only will you be prepared for all of the ‘bad’ things that might happen, but you’re also going to learn about how to make the most of this prime time of your life! If you’re ready to dive right into this stage of your life, you need to pick up a copy of "Senior Living : Discover The Secrets To Living Your Golden Years To Their Fullest" right now. No matter what worries you or what you just want to learn about, I have included it in this 53 page eBook. What, or who, is a senior citizen? Is it really that easy of a question? And that’s just in the first few pages. Since being a senior citizen is sort of a ‘taboo’ topic, I’m going to be honest with you because you deserve to know the facts. You deserve to know exactly what you might need to know or prepare. And all of the details are in "Senior Living : Discover The Secrets To Living Your Golden Years To Their Fullest." Maybe you’re a grandparent or you’re a widow, maybe you’re happily married or happily single; it doesn’t matter. You should be learning about the various ways that you can stay active in your life in order to enjoy these golden years. Since a lot of seniors want to learn about where they might want to live, I went ahead and started with the various ins and outs of senior communities, how they work, and what they can do for you. With this information, you’ll be able to make an educated decision based on your needs as well as your preferences in housing. Even if you feel that changing your housing situation is a long time off, this information will be an asset for making those future plans. But being a senior isn’t all about Medicare or Medicaid, is it? In "Senior Living : Discover The Secrets To Living Your Golden Years To Their Fullest" I’m also going to talk about love and romance as a senior – because love blooms at any age. These tips are perfect for the senior that’s ready to start meeting people, even if you’re not looking for love. Wait : there’s more to learn! Getting back to taking care of yourself, you have different concerns when you are a senior than you did when you were a little younger in years. You might be concerned about your nutrition or require more specialized care, but you may not know just how to handle these concerns. This information might not be necessary right at this moment, but taking the time to get a grasp on what you can use for yourself or for your partner can help to alleviate any worries that you have. You’re wise to be worried about maintaining your health when you’re a senior citizen. The saying goes that, ‘At least you have your health,’ but that only applies when you actually take care of yourself. With all of this information, you’re probably wondering if you’ll even have time for new hobbies with all that you have to learn. However, if you order a copy of "Senior Living : Discover The Secrets To Living Your Golden Years To Their Fullest" I will also include a special report called, "Seniors and the Internet." This report includes 12 pages of easy to understand advice about using your computer to interact with others as well as learn about new things. With these skills, you don’t have to feel like you’re not up to speed with the latest information and technology because you’ll have all the information you need right at your fingertips. Just because you’re not as young as you used to be, doesn’t mean that you can’t continue learning. So what will this book and special report do for you? When you order a copy of "Senior Living : Discover The Secrets To Living Your Golden Years To Their Fullest," you’re actually getting the peace of mind that comes along with knowledge. Your senior years should be filled with fun and activity, not worrying about the ‘boring’ planning details that everyone else seems to focus on. This is about making the most of your life and realizing that every day can be better than the one before. With "Senior Living : Discover The Secrets To Living Your Golden Years To Their Fullest" you can stay active in your life not sit on the sidelines. These types of communities offer living arrangements with aids and services available to help residents live independently. Most residents in assisted living communities are able to take care of themselves for the most part, but require help with some daily activities. This means that in assisted living communities help is generally offered for day-to-day tasks such as taking medicine, bathing, using the bathroom, dressing, getting to appointments, housecleaning, or preparing meals. Some assisted living facilities help residents grocery shop or shop for personal items such as toiletries or clothes. The purpose of assisted living facilities is to allow residents to live as independently as possible even with disabilities, handicaps, or physical and mental challenges. Most assisted living facilities also strive to help residents live full social lives. The majority of assisted living facilities organize group outings, and recreational and social programs. A common dining room is also available for use to help encourage social interaction. Residents in assisted living communities usually pay a regular monthly rent with additional charges for each needed or desired service. These types of facilities can be a good value if you only need or want help with a small number of tasks like cooking, laundry, and reminders for taking medications. Typical costs for assisted living communities are approximately $1,000 per month. Some long-term care insurances cover these costs. Independent living communities are seniors-only housing communities that have standard safety features to make it easy for residents to get around, but offer no care options. Some independent living communities offer wellness programs. GET IT NOW FOR $ 2 ! What's great about this book is that you're not going to have to go to the local bookstore or wait for an internet order to arrive at your home. You will be able to start reading and making your plans in just minutes. We are so confident you are going to love this book that we offer a 100% satisfaction guarantee! If you don't agree that the book has everything we say it does, just write us and let us know. Still not convinced? Download our special report on "Seniors and the Internet", it's free!